Is it snowing in Ax 3 Domaines ?¡Gracias! Ax 3 Domaines is three ski areas centred around the ancient thermal spa town of Ax near Andorra. 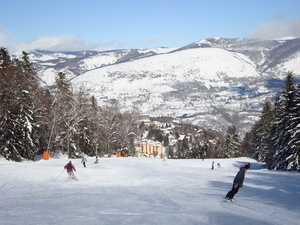 There is skiing for all abilities at Ax 3 Domaines and the heights of the resort are between 1400 and 2400m of altitude. There is 75 kms of terrain to explore with 35 groomed trails. The area is serviced by 17 lifts (1 gondola, 4 chair lifts and 12 surface lifts). I have been taking my family to Ax for 6 years now. It is a lovely ancient thermal spa town in the Pyrenees with bags of history and a ski resort above the town. There is a great market twice a week; lots of small independent shops and restaurants and plenty of characterful places to stay. The resort itself is compact and very family-friendly, but still has 75km of pistes to suit all ages and abilities. It is less chi-chi than the alps, less banging than Andorra, and cheaper than both in terms of lift passes and ski hire. If you avoid French school holidays it isn't very crowded either. 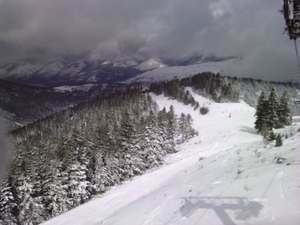 There are pistes up to 2400m and plenty of snow cannons as well, so the conditions are generally good. There are also lots of other great winter sports activities available, such as: dog sledding, Nordic skiing, ski-joering, snow trekking, ice climbing, sledging, & snow biking. Just a quick note regarding an older review: there is a now a bypass around the town that takes out the through-traffic on its way to Andorra, so the town centre is much quieter and easy to navigate even in high season. There is a Park & Ride scheme that operates between the railway station and the ski resort, and there are navettes (minibuses) that run between several of the outlying villages and the resort. There is also extensive (free) parking at the resort itself.